L: 116" x W: 88" x H: 38"
Desmond 2-pc. Sectional Sofa The comfortable, contemporary design of this Desmond 2-piece sectional sofa features plush boxed seating and back cushions, giving you the comfort you desire while helping enhance your home's decor with exciting jumbo stitch detailing and tufted accents that embrace the modern style. The comfortable, contemporary design of this Desmond 2-piece sectional sofa features plush boxed seating and back cushions, giving you the comfort you desire while helping enhance your home's decor with exciting jumbo stitch detailing and tufted accents that embrace the modern style. L: 80" x W: 36" x H: 38"
L: 88" x W: 36" x H: 38"
I was a little skeptical ordering a couch online without physically seeing it. However I was very surprised when I received it. it looked great and the cushion wasn't too soft or too stiff. Which means it will hold up for a few years. Fabric also looks durable but not rough or harsh. *Color is darker than how it looks online. Its more of a darker grey/charcoal as the color listed. It is a big sectional so make sure you measure you area/space. It did have a "brand new" plastic smell to it but it must be because it came wrapped in plastic. Smell has now gone away. The picture does not do this sectional justice and, of course, you can't possibly appreciate how comfortable it is by looking at it. I love it! My only question is...why is there an Ashley Furniture tag on it? we love this new couch! 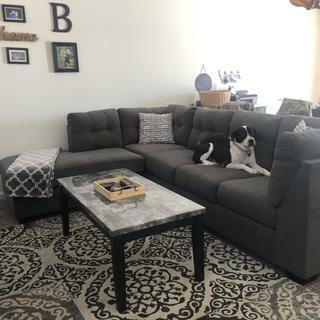 The grey color is a fabulous neutral and the couch and chaise (and matching ottoman sold separately) are not only comfortable, but the perfect fit for our new home! Thank you Raymour & Flanigan! The best sectional sofa you could buy sight unseen! I'd never think I'd be so thrilled with the purchase of a sofa online. I was so frustrated with the prices, and shopping in the store , I couldn't find anything. This was perfect and reasonable so I took a risk. I can't tell you how happy my whole family is, or how many compliments we've gotten! Held up for our full house during the holidays and has hosted many living room sleepovers and handouts! Comfortable, stylish and a great addition to our red accent wall in our living room! Beautiful fit, and color! Such a compliment for any living room. The price was great. The ottoman is a perfect fit. It is very comfortable. It IS an Ashley set, but I am always more than happy with Raymore and Flanigan. Thank you again for another great experience! delivery was super fast and very professional. This couch is awesome. So comfortable and am awesome price. I hope it holds up and my kids don't ruin it right away but I definitely recommend this couch. I live in an apartment and thought it would be too big but it's perfect! I purchased this sofa online about 6 months ago. I did write a review before but never heard back. First I have to say this about the sofa and service. The sofa arrived on time and the delivery guys unwrapped , assembled, brought it in and placed it exactly where I wanted it all within a few short friendly minutes. 5 stars for service. The sofa itself is quite large so definately measure and keep the chaise in mind. You do have the option of facing left or facing right . The sofa looks decent. Actually quite attractive. The fabric seems durable and thick. It is a comfortable piece as well. Not too soft or stiff. Im pleased with the initial appeareance and comfort. 4 stars would be appropriate . The value (Just over $700 ) can't be beat!!! It really is a solid piece. However here is my issue, after a few months of use the tailored lines have shifted and now the sofa looks like bad ugly suit. There is no way to adjust the pillows so I can only imagine that they will get worse. I do think it may be a flaw to this particular sofa perhaps since I dont see any other complaints simular. The sofa remains comfortable but I'm forced to cover it up. Mama got a new couch. I am very happy with my purchase. This sectional is firm and comfortable. It gave my livingroom the fresh modern look it needed, plus, providing plenty of seating all while being affordable. I would recommend this sectional to everyone. Thank you. Durable, comfortable, easily seats multiple adults. Clean lines, great color. I’ve recommended this to multiple friends and family members who may be looking to purchase soon. Great buy. I love it , so comfortable. The pillow backs are great! Love the look of the couch, really should have paid attention to how many cushions there are 4 across and then one long one for the chaise lounge part, if you lay across on it that's where your legs will be. If there were 2 large cushions I think would be best. As soon as you sit down the cushions sink, then move outward only small pieces of velcro hold it or try to hold it in place. I find myself playing with the cushions to see if they would fit better in a different spot. the corner one fits the worse, that's where it connects to the other part of the couch. The couch comes in 2 pieces withe metal clasps that connect together. I have tried to put cardboard underneath then that interferes with the velcro. Great couch at a budget price. I dislike nothing at all. The price was awesome, the chair is soooo beautiful with great stitch work. Its so comfortable lol i cant wait to put up my projector and watch movies. We just received the sofa so my review is based on our initial thoughts. This sofa is great! The color is slightly darker than the picture. The cushions are thick, firm, and fit snuggly in place. The fabric seams durable and easy to clean. I wasn't sure how i was going to like having the high side end on the sofa section but this is actually wonderful because it allows you sit comfortably on that end in multiple ways making it quite functional. The sofa is quite large so make sure to measure your space, and its bulkier than I had thought and was surprised it just barely squeezed through the doorway when delivered. But the size works well for us with three adults and two larger dogs - plenty of room for all to be comfortable! Quite happy with our purchase, and the price is awesome for what you get!! Would highly recommend! It’s feels big but fits perfectly in my studio. Comfortable and great color. we love this couch. it’s the perfect size & incredibly comfortable. would recommend. I love this Desmond set. Love the color and quality. Delivery and set up was amazing. Carol and Bill were great. Couch is great, comfy, and fits so well in my new apartment. Highly recommend!!!!! I love this piece. It's spacious and comfortable. I like that the cushions are sown to the back of the sofa so there's no need to fluff them at any time. From the experience in the store with Dawn down to delivery we’re so happy we decided to shop at Raymour for our new couch. It’s just what we were looking for. Super comfortable but supportive. It looks really well made. I even accidentally fell asleep on it last night & woke up just as refresh as when I sleep in my bed. Incredibly happy with our new couch. This was a good purchase for the room it was placed in. Great sofa!!! Fabric and cushions are amazing!!! This was first time online purchase , I rather go to store and touch it. Delivery people were awesome. They know what they are doing!!!! Highly recommend!!! Great piece & the movers were very nice & helpful. Did not see before ordering, was assured I would like it and I did. Great piece of furniture. Overall we are very pleased with this couch! We Love our new couch! It is comfortable, spacious and not to mention stylish and modern. It looks great in our living room and now we have more space for family gatherings! My husband and I looked at this couch for about 2 months. We went into our local Raymour & Flanigan to try it out. Since it was an outlet couch our store didn’t have it in stock there, but the sales person we had was so great, she was very patient, showed up a very similar couch they did have, gave us SO much information this couch. They were very patient & not pushy with us. We just went back & bought it the other day, it came within two days! Delivery was super easy. As well. Quality of the couch is great, we have 3 cats & a dog. They all love it, it’s easy to clean. Love the color also. Overall we’re very happy with our purchase & to have our first couch we’ve bought together for a long time! We love the color, & microfiber! Very comfortable. Delivery was fast & easy. Love the unique open ended style of this couch. 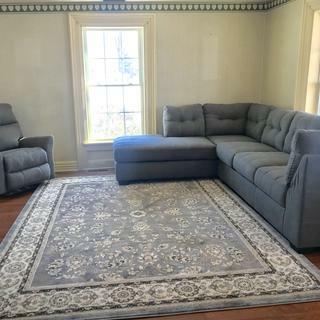 Purchased two ottomans with it to extend the couch and make a three sided square. Sides high, couch wide extremely comfortable. Easy to wipe spills. Purchase ottomans together with couch to get same dye lot. My only bother is that this couch needs to be against a wall as I have gotten bruised bumping into the back corner as it is a hard wood corner under thick fabric, a concern if I were to have young kids running around. This sofa was perfect! I love the stitch details, it makes it less basic than I thought it was going to be. It's very comfy without being broken in and much larger than we expected. I am beyond happy with my purchase especially since it was significantly less than most other sectionals. You can easily fit 5 people! Incredibly strong and comfortable. Very relaxing to sit, or lay on. Bought the charcoal and can’t say enough good things about it. We love the style and feel. Just a few sample defects which they said they will come over and fix. We are so excited about our new couch! It fits perfectly in our space. There is more than enough room for our family of five. Thanks to the staff at Raymour and Flanigan for making this purchase such an easy experience. The delievery was seamless as well! Price was excellent, delivery time was fast, quality of product was definitely better! I order this online base on the reviews only because the actual store does not have this sectional sofa. My sofa came on time and it looks better in person. I can honestly tell you that it is VERY comfortable with a great balance of firm and softness and worth the money. This product was so good that I took time out to write a review. Now I just have to make it to my bed at night. The sofa tends to hold me hostage. We love the couch, the couch is comfy, also the delivery was quick and fast. What fabric is on the Ashley Desmond line - microfiber, other? Can anyone comment on how it wears? I have a family with young kids and need furniture that will hold up well. BEST ANSWER: The Desmond Sectional does have a microfiber upholstery. It is pre-approved for wearability and durability against AHFA standards. How big is each piece individually? BEST ANSWER: The dimensions of the Right-Arm-Facing Sofa are 80" L X 36" W X 38" H. The Left-Arm-Facing Corner Chaise measurements are 36"L X 88" W X 38" H.
Our door width is 29”. If we take off the legs will the couch fit? BEST ANSWER: The Desmond 2-pc. Sectional Sofa requires at least a 32" wide doorway with the legs off. Can I find the Desmond line in a store to look at it? BEST ANSWER: The Desmond Sectional is sold as an Outlet item which means, although you can order from any showroom, online or over the telephone, it is displayed in a Raymour & Flanigan Outlet Center. Is this product from Ashley's Furniture? Someone mentioned that the sofa had a tag that said Ashley's. BEST ANSWER: Many of our products come from many different vendors, Ashley Furniture being one of them. How firm are the cushions? BEST ANSWER: The cushions on the Desmond Sectional Sofa are considered of a medium range firmness. Do the seat cushions have zippers on them to wash??? BEST ANSWER: The seat cushions do have zippers. Can the legs be removed? BEST ANSWER: The legs can be removed. BEST ANSWER: The dimension of the Desmond 2-pc Sectional Sofa with the sofa and chaise connected is 116" L x 88" W x 38" H. The Desmond Sectional will require a 32" door opening. How long is the sectional from the corner to the end? My living room is 13 ft across and I want to make sure the couch isn't going to be too long! BEST ANSWER: The length is 116" which is about 9.5 feet. The width is 88" that is 7 feet. how do you determine right arm or left arm chaise? Is it facing the couch? BEST ANSWER: Yes, right arm or left arm chaise is determined by facing the sofa. do the 2 pieces lock together? BEST ANSWER: Yes. The pieces are connected with U-Clips. Can the chaise lounge be placed on either side of the couch? BEST ANSWER: The Desmond Sectional is available in the opposite configuration under SKU # 294466492, however, the lounge is not reversible within the same sectional. What is the length of the chaise and how deep are the seats of the couch? How much weight does the desmond 2 piece sectional hold? BEST ANSWER: Although there is no specific weight limit for the Desmond Sectional Sofa, 250 lbs per seat would be a good guideline. Are the back cautions attached? BEST ANSWER: The back cushions are attached. BEST ANSWER: The legs are 3" high. BEST ANSWER: The Desmond Sectional has removable seat cushions and attached back cushions. If this is microfiber then is it stain resistant? What is the color of this sofa? It looks to me that it's either grayish blue or just light gray? BEST ANSWER: The color is a charcoal gray. Are all the cushions reversible? None of the cushions are reversible. They are all attached to the back of the sofa and cannot be removed. No. They are not. There is a Velcro strip on the backside to secure the cushions to the couch. The back cushions are not reversible. They are attached to the sectional. How do you assemble to feet? BEST ANSWER: They screw in place but the excellent delivery service does it all for you. They screw into place. I think two screws per feet. They screw on to the couch. They screw in, very easy. Is the chaise comfortable for over night guests? BEST ANSWER: As it is very comfortable, we also offer this exact sectional sofa that includes a full sleeper, if you are interested! You can search by SKU: 296466494 Desmond 2-pc. Sectional Sofa w/ Full Sleeper. Yes... I’ve fallen asleep on it plenty of times while watching tv. Yes, I fall asleep on my sofa all the time. How is this couch with pets? Is it easy to clean? BEST ANSWER: It is easy to clean. I have a dog and I have no problem cleaning up after him. How can I get a replacement cover for one of the cushions? BEST ANSWER: Hello Lauren. For assistance with replacement cushions, please contact customer care at 866.383.4484, option 7! I have never needed a replacement cover but I would suggest contacting Raymour and Flanigan directly. Is the fabric microfiber and how does it clean? What material is the couch constructed from? BEST ANSWER: Hello Kelley! Please refer to our recommend cleaning instructions: Lightly brush or vacuum frequently to remove dust. Spot clean with a mild, water-free solvent or professional dry-cleaning product only. Pre-test cleaning methods on a hidden surface. A professional cleaning service is recommended for an overall soiled condition. It is not microfiber. I have it in a office room, so it doesn’t get a lot of use. I never had to clean it. Are the back pillows and cushions reversible and removable? No, but the bottom cushions can be taken off but the other side is a different fabric. The back are sewn on so you can’t remove them at all. Does this sofa have storage space? Does it contain a pull out bed? BEST ANSWER: There is no storage space. We do offer the Desmond 2-pc. 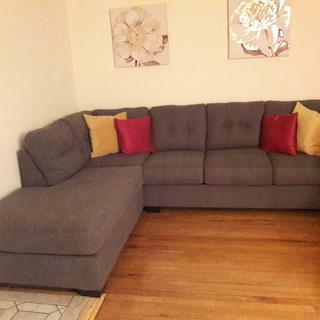 Sectional Sofa with a sleeper, if interested - you can search by 296466494 Desmond 2-pc. 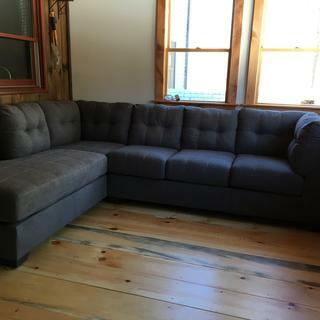 Sectional Sofa w/ Full Sleeper. What's the minimum width I need to get these through my doorway? BEST ANSWER: The recommended door width is 32"